It’s a new year, and a new American Honey Queen and Princess have been chosen to represent the American Beekeeping Federation and travel across the country speaking about honeybees and beekeeping. A panel of judges makes the final decision, but have you ever wondered how a honeybee colony gets a new queen bee? 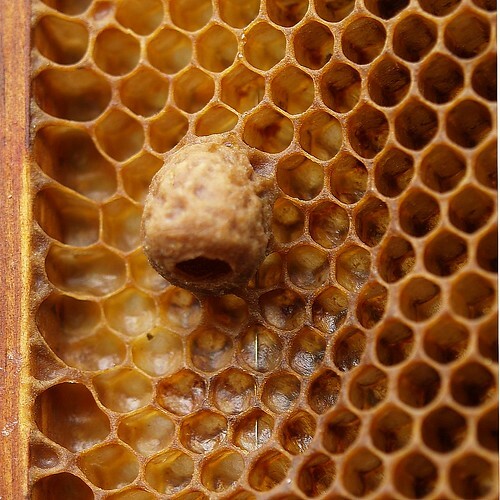 In our world, a person might be elected or chosen to become a queen, but in the world of the honeybee, a tiny egg is destined to develop into a queen from nearly the first day of its life. The queen bee has the very important job of laying all the eggs inside the hive. If a queen bee is growing old or if she suddenly dies, the worker bees must make a new queen in a hurry so there will be a queen in the hive to start laying eggs again. To make a queen bee, workers select a few fertilized eggs and they begin to expand the size of their cells. These special queen cells are about the size and shape of peanut shells. The queen bee is the largest bee in the hive, and she needs plenty of room to develop and grow. As the egg grows into a larva, which looks like a fat, white worm, the worker bees start to feed the young larvae a special substance called royal jelly, which is produced from glands inside the workers’ mouths. Royal jelly is bee super food. It is very rich in calories, vitamins, and proteins. Every honeybee larva, including workers and drones, eats a small amount of royal jelly during its development, but a larva that is going to be a queen bee needs a lot of it every day of her life. As the larvae eat the royal jelly, their bodies change and they develop into queen bees instead of regular worker bees. After 16 days, a brand new queen emerges. 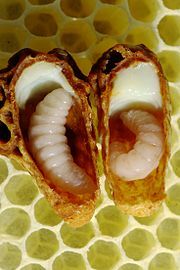 A queen larva inside her cell. Do you see the royal jelly? A queen cell is about the size and shape of a peanut shell. This queen is marked blue. What year was she born? Beekeepers will use a yellow dot to mark all queens produced in 2012. What color would you be if you were a queen? Use the chart to find out! For example, if you were born in 2003, you would be marked with a red dot.